It doesn’t take an expert to know that it is uncommon to find an inexpensive high quality product. 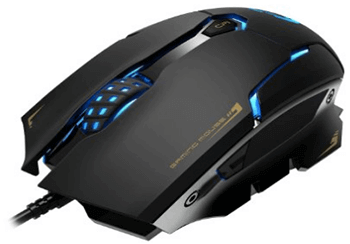 And as someone who has tested dozens and dozens of mice I’ve found that, more often than not, inexpensive gaming mice end up being a cool-looking version of your average office mouse. But every now and then you’ll encounter a product with high quality features AND a low price tag. After a week of testing the Comanro’s DM004, it proved itself to be an cheap gaming mouse with genuinely high quality features. Comanro did a great job at cutting down on costs while maintaining the ergonomic design of a superior class gaming mouse. One notable feature is the mouse’s tungsten gold plating, a super class A grade material, which made for a surprisingly smooth and comfortable grip designed to address the problem of sweaty palms. When I’m handling a mouse I typically dislike any thin and ultra light design. Weighing in at 4.8 ounces, Comanro utilized a symmetrical ergonomic design with a nice thick body making for a firm grip on the sides. 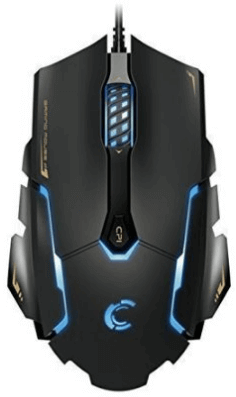 Two other notable features of the mouse are its 6’ braided fiber cable and anti-skid scroll wheel. The cable felt sturdy and reliable, unlike the standard mice cables that tend to fray after normal wear and tear. I even brought the mouse with me on two trips and not once did the cable get tangled, which never made it a problem to pack and unpack. One of the things I always test with any mouse is the scrolling accuracy. For the Comanro I noticed that it did fairly well with quick direction changes, only falling short a couple of times. Small step scrolling was also generally smooth and accurate. I’m very satisfied with the mouse’s anti-skid scroll wheel in this regard. I found the biggest drawback of the design to be its 6 programmable buttons that change the color and resolution. The only problem is that I find the buttons to be a bit excessive for most gamers. While in theory 3 buttons on each side of the mouse may seem like a more diverse mouse, in reality, most people only use about 3-4 programmable buttons. The buttons also didn’t feel very durable and were slower to respond than preferable. I found myself having to click firmly at times or even two times to get a response. After only a few days of heavy use the buttons were actually sticking, which can be expected of a low-cost mouse. While the mouse’s technical specs won’t dazzle you, they are permissible for most serious gamers. The Comanro DM004 has 4 DPI settings to choose from (500-1500-2000-35000). A particularly nice feature about the mouse is that you can change the DPI setting by clicking the scroll button. Changing the DPI setting also activates different lights (red, blue, purple, and green), which is always a beneficial feature of any cheap gaming mouse when you’re in the middle of a fast paced first-person shooter match. The Avago 3050 sensor is laser infrared that truly worked wonders considering the low-cost of the mouse. I’m a big time first-person shooter gamer where sensitivity truly makes a difference. There’s nothing more frustrating to a serious gamer than to find yourself fighting with the mouse more so than your opponents, but the Avago sensor stood up to my expectations and needs by being surprisingly smooth and effortless. The Omron micro switch is yet again another feature that you typically won’t find in a budget gaming mouse. Omron is known for their high quality switches that allow you to make precise and quick small movements. 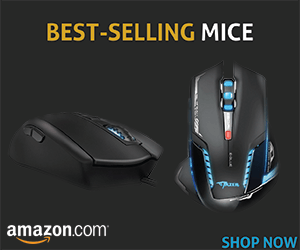 The mouse has three optional report rates (250-500-1000 HZ). I found 500 HZ to be within my comfort zone and among the three options I think most users would find the Comanro to be a versatile mouse with adequate settings for different requirements of accuracy and speed. On the bottom of the mouse is a 3-position switch that adjusts for optimal refresh rate. I found that the mouse didn’t lose any rate by switching between settings, which is evidence of its ability to identify and feedback speed. Overall, after playing several death matches on CS: GO with the DM004 it’s hard to point out any major design or technical flaws. In fact, the DM0004 far exceeded my expectations with its range, accuracy, and comfortable grip. 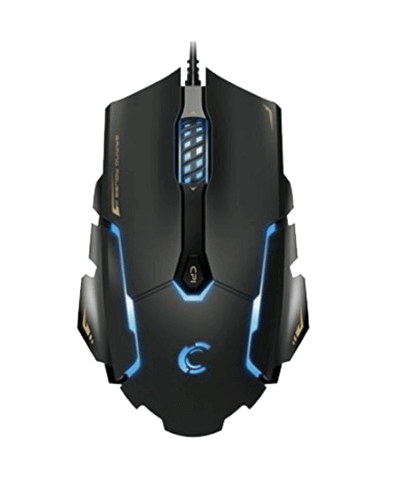 For any serious gamer on a budget, the Comanro’s DM004 will work wonders as it’s by no means limited to a stellar exterior like most budget gaming mice. With its simple and straightforward DPI and light settings as well as a high-quality sensor, the mouse proved itself to be one of the best bang-for-your-buck deals on the market.